Clear your overgrown weeds easily with the Bachtold Brothers H8200 Walk-Behind Weed Brush Mower. This quality mower is powered by a 8 HP Honda™ OHV engine and is ideal for clearing overgrown weeds, sagebrush and saplings, for cutting trails through the woods and for clearing. 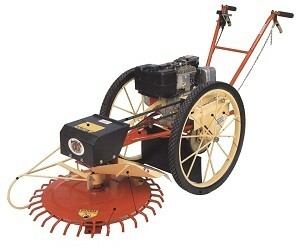 The mower comes equipped with 3/8" spokes and industrial 16" diameter diamond tread tires with gripper beads.